Welcome to my newly redesigned Fiero 2M4 resource site. The original site recorded over 12000 visits, hopefully this one will also prove as useful. My Fierorock site is gone, here are a few pictures of the latest developments, Enjoy! 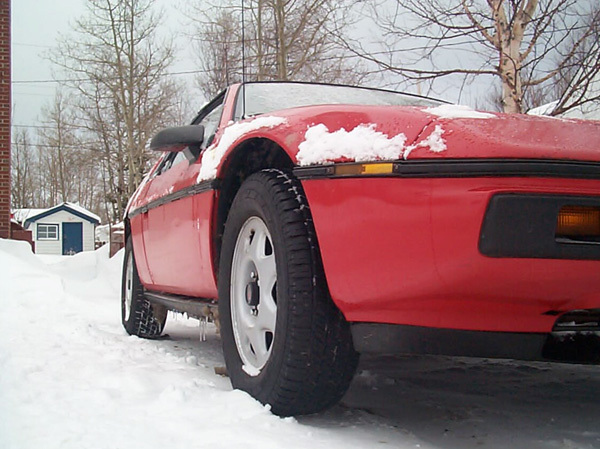 Winter is no good reason to park your Fiero, here is mine ready for sub-zero combat. The wheels are 14" X 5.5" Dodge Shadow styled steel and the tires are Canadian Tire Nordic Ice Tracs in 205/70 X 14 size. This setup makes the car an entertaining and reliable winter handler. My interior modifications started the day I brought it home. The steering wheel is a 1976 vintage Grant (made by RAID in Italy) with my own, hand sewn, cover and the original Fiero wheel centre. 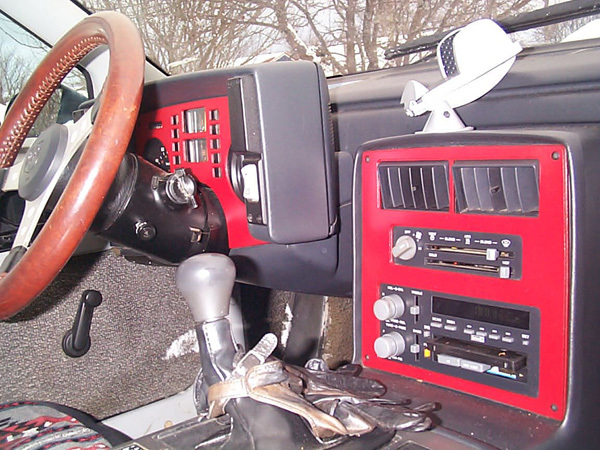 The red dash panels were from my 1984, painted body colour. The shifter is a 1984 stick (about 1.5" shorter than the 1985 shifter). The black and red Alpena pedals should look good in this interior. Note, the multi colour seat covers will stay, but mainly to cover seat damage rather than as a fashion statement. Here are my Fiero club stickers, anyone have something not shown here drop me a line and maybe I can expand the collection onto the decklid interior. A Dodge Shadow donated its rear spoiler to my Fiero, looks like it was meant to be there. The vented hood and relocated battery are ongoing projects now that the entire suspension has been replaced by 1984 parts (including the subframes). As with any old car, there will be many other issues relating to rust and decay. Electrical wiring, vacuum hoses and upper frame rail rust will be dealt with over the next few months. The car is now about 80% complete.